OS: Mac OS X 10.3.9 "Panther"
The second generation iBook, called �snow� because of its white translucent color, was part of the new generation Macintosh computers. The series of Macs, easily recognizable by the transparent cases, were the first to feature USB instead of legacy interfaces like ADB, SCSI and RS232 (serial port). Like the iMac, it came with a CD-ROM drive and two USB ports. The notebook was originally shipped with Mac OS 9.2.1 or OS X 10.1 (Upgradable to Mac OS X 10.4). 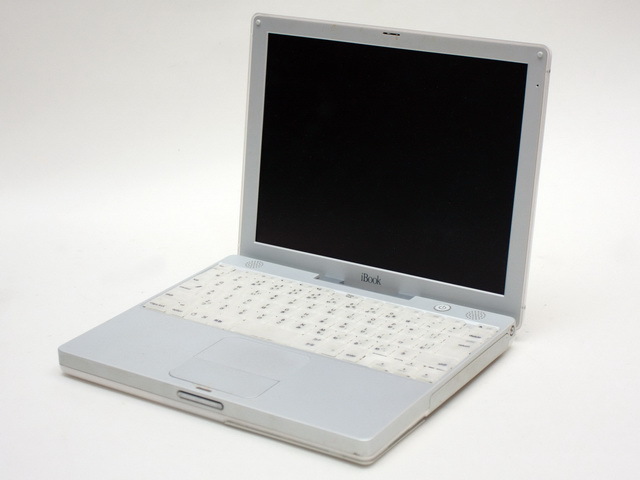 This iBook succeeded the previous Clamshell model, which lacked portability due to its form-factor, weight and size. Altogether with the larger screen resolution of 1024x768 pixels and larger onboard memory, the iBook �snow� set the standard for later portable Macintoshes.